A couple of years ago when it was my now 17 year old’s first year to be too old to trick or treat, we had a bunch of her friends over for a Halloween party. Unfortunately, it was pre-blogging days and I didn’t take very many pictures. The party was great fun, with all kinds of themed foods and a scavenger hunt around the neighborhood. But the biggest impact for the least amount of stress was this scary eyes cake. It was VERY, VERY easy (my favorite kind). Make any box or homemade layer cake. I used store bought chocolate frosting (you’ll want 2 cans to make sure you have enough, but you’ll use less than half of the 2nd can). I put the frosting into a pastry bag and piped squiggles, using the star shaped tip, all over the sides and top of the cake. You’ll get tired piping miles and miles of squiggles, but you absolutely can’t mess it up ’cause it’s supposed to be messed up. This is the fun part. Get any and all “eye” shaped candies. We used M & M’s , Skittles, gummy rings, candy corn pumpkins, and jelly beans. Play around combining them to make different styles of eyes. Try stacking smaller candies on larger ones to give the eyes more dimension. 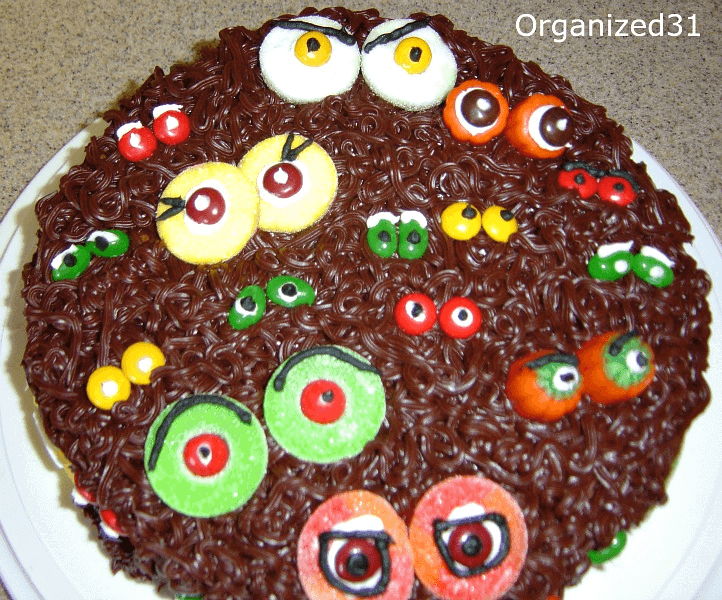 Put the eyes all over the sides and top of the cake first then decorate them with various icing to make different styles of eyes. I just used store bought icing in the tube for this part. You’re going for the idea of lots of different cartoony scary eyes looking out at you. So add pupils, eye brows, eye liner, eye lashes, whatever your imagination can create. Super easy and idiot-proof Halloween cake. If you make a mistake, just confidently say, “I meant to do that” and no one will know any different. I love that! How much fun. Hi! I’d like to invite you to join our Halloween Link Drive! Cute, I love all the eyes! Thanks for sharing at The Fun In Functional! This is the cutest cake. I love it. Thanks so much for linking with Adorned From Above’s link Party. So cute and easy! Thanks for linking up at DIY Thrifty Thursday! You’ve been featured! Drop by and grab an “I was featured” button….Hope to see you again this week! This is absolutely adorable! Love all the cool eyes! I think my kids would love this! I saw you at ItsyBitsy – your cake is so cute. 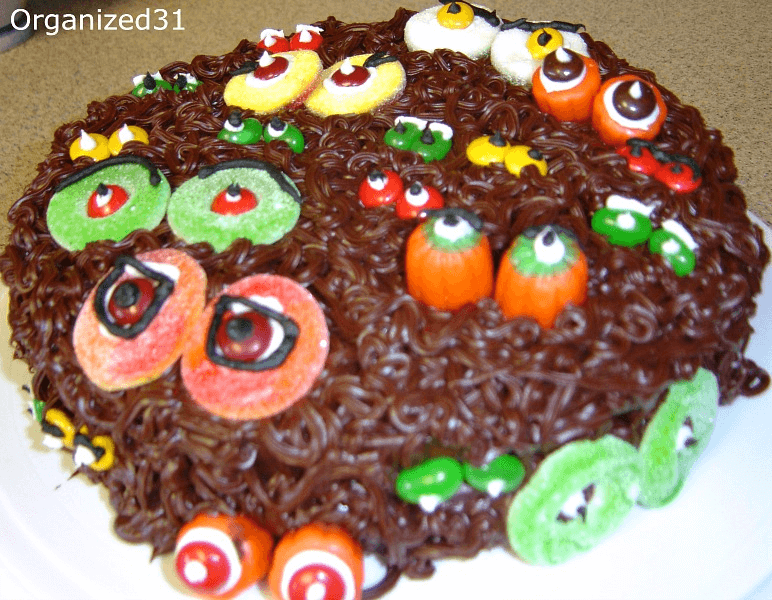 We always do fun, scary, creepy, eeky foods for Halloween and this one would be perfect. I can just hear the kids saying which piece they wanted with which set of eyes!